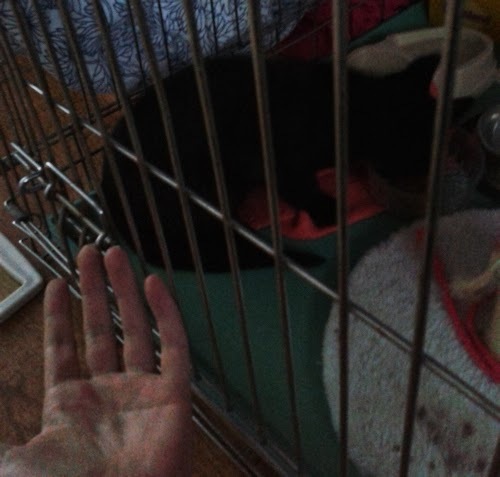 Hey all :) As I mentionned the other day, I picked up a new fosterkitten, so I won't be showing my nails today. But I can assure you, he has some too, lol! This poor little guy comes from a TNR (trap-neuter-return), where they catch stray/feral cats, neuter them and place them back out again, or if possible, try to socialize them. This kitten was found with his brother, sister, and his mum, but mum really was too wild so she's neutered and back to where she came from. 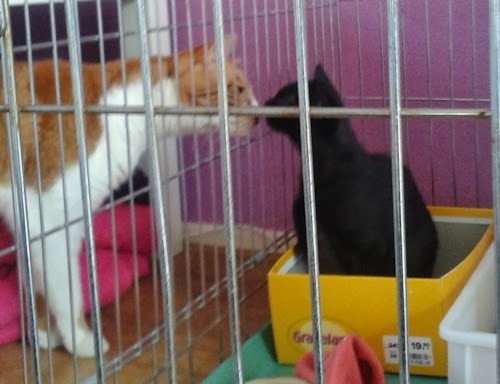 The 3 kittens went to a fosterhome about 6 weeks ago, and the shelter quickly gave that home 2 friendly kittens as well, to help the 3 scared ones adapt. 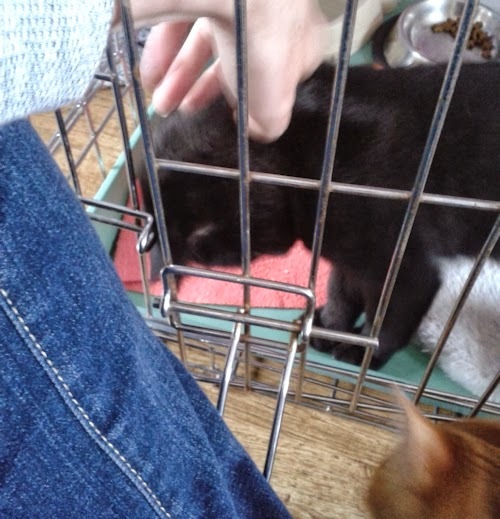 The 2 other ones did adjust and will hopefully go up for adoption soon, but this one stayed scared and unapproachable. 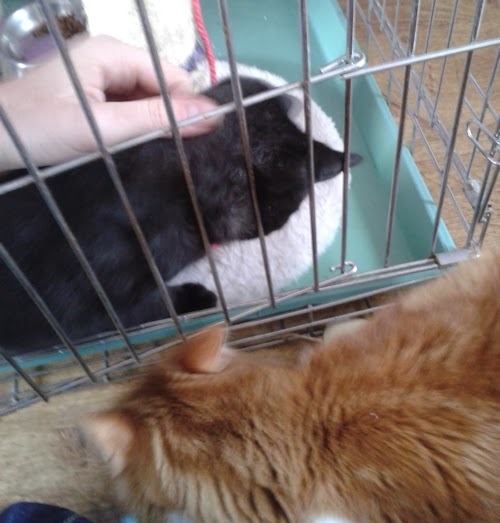 The shelter was hoping he'd react better to a home where they have friendly adult cats, to give the good example, and that's how he ended up with me! Unfortunately I have to start from scratch with him, which means he's locked up in a bench. 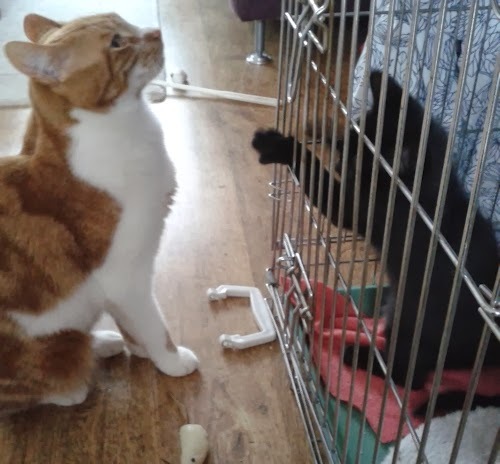 He's around 13 weeks old, and a kitten that age doesn't want to be locked up, I feel really sorry for him as well :( But it's for the best, and in a matter of days he has already taken so much tiny steps forward with the help of my Dewey! Also a few steps back, but the positive improvements outweight that by far! Ahh it's so great to see how one kitten from a TNR became an adult cat that helps other TNR kittens ♥ Without his help I wouldn't have managed to do much yet at all, but when Dew's around he's so loving Dew that he forgets about me sitting there as well, and omgomg I even got to pet him today! But as soon Dewdew's gone, he's back to ears flat/big eyes/growling and ready to attack (and he slaps fast :P). So the goal is to have him relaxed around me with ánd without Dew around, and when that's the case, he'll get more space. We'll take it one step at a time, but because of his age as well, I want to work with him as fast as he can. 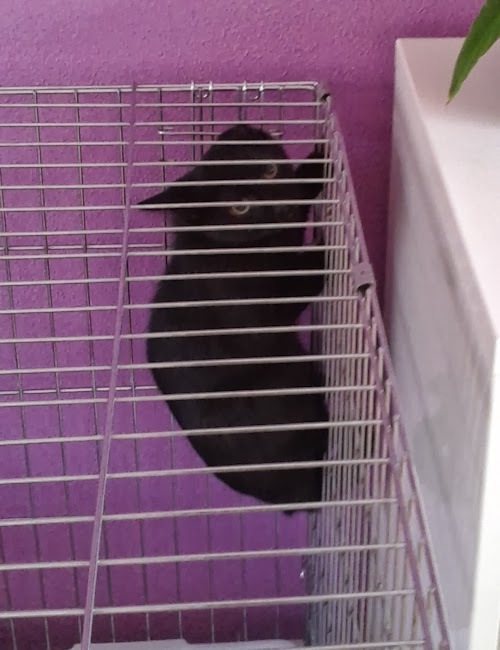 When I got home with him, I opened his cage and he instantly flew in the corner of the bench, poor thing. (and no, my walls ain't thát purple, my cam can't handle the warm color well :P) Especially with cats like this it's best to not look at them, or if you do look at them, blink slowly and often with both eyes. I took my phone instead, so I could keep an eye on him on the screen instead of looking directly at him. 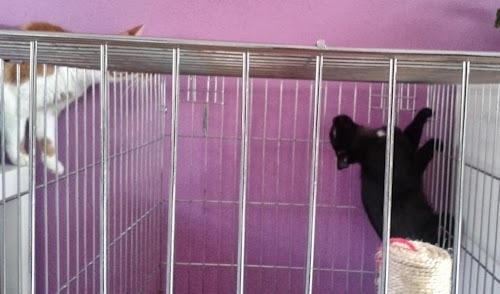 While he was hanging there he freaked out my girls with his panic meows and growls, but Dew doesn't care so much about all that and the kitten quickly spotted him. 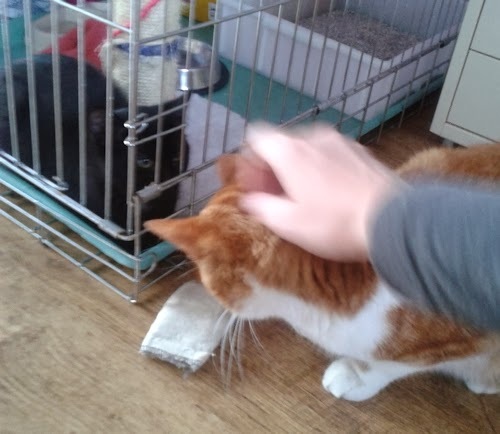 But yesterday he seemed to be doing a bit better and was crazy about Dew again, and here's why it's so important to have friendly adult cats around a kitten like this, he needs to see they come to me and I pet them and such! The fact that he stayed there in that corner within a day, really gave me a lot of hope, he's improving SO much faster than expected! Dew's being so great with him, that kitten tries to throw himself at him, pokes him loads, and he just sits there ♥ At times he looks so wise at me, like he understands that I need him to help :) But at other times he's just interested in the kittenfood and sees the bench as a huge activityboard where he can fish out food, lol! 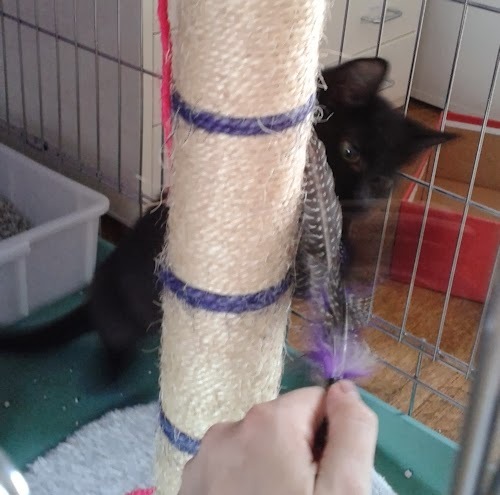 Fostering a kitten like this is SO rewarding, it costs me a lot of energy but every little step feels like a huge one, and I'm gonna do my best to socialize him as well as he will let me ♥ And he has the most beautiful, shiny black paws! Gotta love shiny black fur on cats :) Last thing: he needs a new name! The previous fosterhome named him after Ivan the Terrible, and I want to name him after something brave or innocent or something sweeter than that at least :P I was thinking of Basil, it means brave as far as I know, but if you have suggestions, please share! !